Water, Sanitation & Hygiene (WASH) in Public Sector Schools Strategic Plan for Balochistan 2017 – 2022 Merit based recruitment through NTS (NTS) Balochistan Education Sector Plan 2013-18 approved (BESP) Act on Free and Compulsory Education has been promulgated (Rules under process)(Act) Reforms In Examination And Assessment System Medium Of Instruction In English From Grade 6th Act on Introduction of Mother Language In Early Grades Has Been Promulgated (Books will be distributed by 30th Oct, 2014) (Act). Chief Minister Education Award Endowment Fund of Rs.500 Million has been created (Vetting of Draft Agreement with NBP is awaited). Promotion of Science and IT Education at school level (Approval Awaited)(Annexure Development of textbooks align with new curriculum 2006. Capacity Building on modern scientific up gradation of professional qualification and CPD Strengthening and expansion Balochistan Education Management Information System (BEMIS). Mutation of land of all government schools in the name of Secondary Education Department Revitalization Co-Curricular/Sports activities Replacement of PTC & CT by ADE & B.Ed (Hon’s) Separation of Management Cadre (Under process) Re-structuring of Education Directorate (Approval awaited) (Annexure) Realignment of PITE and BOC (Approval awaited) (Annexure) Decentralization and Delegation of Administrative and Financial Powers at Directorate / Division /District / Cluster level effected (Annexure) 4800 teachers regularized under Aghaz-eHaqooq Balochistan Adoption of Science and Information Technology. Launching of student voucher scheme through BEF to address Access issue Re-structuring of Directorate of Education (Schools) Legislation on Development of Curriculum, text books and standards Development of District Education Sector Plan. School Management Plans. New recruitment Policy. New procurement Policy. Cluster based trainings (CPD) and procurement. Up gradation of EMIS and Development of Decision support system Establishment of an effective management cadre. 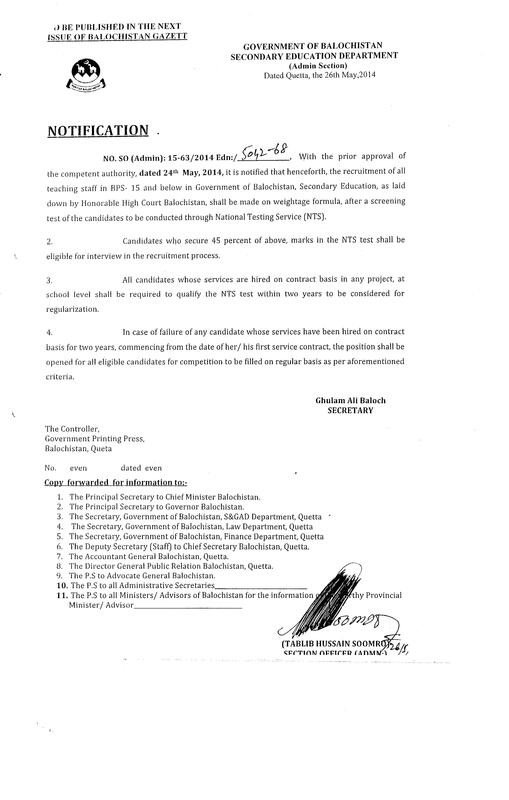 Mutation of School land in the name of Secondary Education Department Up-gradation of professional qualification of in service teachers. Implementation of ALP. Launching of literacy program in mother tongue. Implementation of institutional capacity development plans. Re-alignment of elementary colleges with PITE Utilization of government abandoned buildings for educational purposes. Provision of Rs.1.000 Billion for land acquisition for Government Schools. Case already submitted to the Competent Authority for approval (Approval awaited) Implementation of Balochistan Education Sector Plan under article 25A of the constitution. Main streaming of private educational institutions. Launching of student voucher system through Balochistan Education Foundation. Addressing the gender gap in education. Reduction of transition rates in education. Provision of ICT gadgets. Strengthening of SMCs for participatory education delivery. Co-curricular activities . More focus on science and information technology. Emphasis on English, Mathematics, Science and ICT Educators. Up gradation of teachers input through regular capacity building. Provision of vehicles and bikes for effective monitoring.